I just received the following e-mail from MoveOn.org‘s Wes Boyd and am passing it along. Please pass it along too if you can. 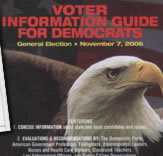 I just received an election ballot slate card in the mail called “Information Guide for Democrats.” I’ll bet you have too. Look for it. Then throw it away. It’s pure deception. And then get mad. Pretending to be a Democratic slate, this mailer recommends against Propositions 87 and 89, the Clean Energy and Clean Money Initiatives. There’s a picture of this mailer in the sidebar to the right, so you can identify it. Corporate interests are spending tens of millions of dollars to defeat these two initiatives. And they don’t mind lying and cheating to get what they want. We have to fight this with the simple truth. And with word of mouth. Please pass this email on to all your friends and relatives in California. We’ve got to get out to vote and defeat these guys. This is a REAL progressive slate. We’ve included a copy of this slate designed for printing and taking to the polls, after this email below. Or go online and check out the endorsements of any public interest organization. The fact is, the Democratic Party, every major Democratic leader in the state, and the most prominent Democrats nationally including President Clinton and Vice President Gore all strongly support the Clean Energy Initiative, Proposition 87. Of course, big oil is absolutely determined to kill it. And every major civic organization supports the Clean Money initiative, Proposition 89, including Common Cause and the League of Women Voters. You can check out the endorsements in the links for each proposition above. Why are big oil and other big money interests working so hard to defeat these progressive initiatives? Because if the truth gets out, they lose. Because if the Clean Money initiative, Proposition 89, passes, they won’t be able to do deceptive mailers like this one. So they’re pulling out all the stops. We have to counter their lying with truth. We have to counter their money with passion and word of mouth. Please pass this email on to everyone you know. And please vote on November 7th.